Advocates say that eating for your body type makes it easier to manage your weight, achieve your best body, and maintain good health. However, most of them show no scientific studies to support their theories or diet advice, so check with your doctor before you start on this type of eating plan. Fitness and nutrition advisors of eating for your body type use various categories to define body types, such as body structure (somatotypes), hormone glands and organ systems, and by where fat tends to distribute (android versus gynoid). Most advocates, such as fitness expert Ryan Andrews of Precision Nutrition, base diet recommendations on the three main somatotypes, ectomorph, mesomorph, and endomorph. A somatotype describes a person's bone structure and muscle and fat mass as formulated by American psychologist Dr. William Sheldon in the 1940s. According to British sports coach Brian Mackenzie, some people may have the extreme form of a somatotype but many people have a mixture of features of each type. Many nutritionists and fitness programs offer similar, general diet recommendations for each somatotype, but the specific percentages of nutrients vary. They also recommend that you include exercises for your body type to boost your diet effort. To maintain enough fat, go light on aerobic exercise and, to increase your lean muscle mass, include weight training in your exercise plan. Add aerobics, such as running, to burn off any excess fat. Maintain lean muscle with weight training. Eat a low-carb, high fiber, high protein, and low-fat diet. The suggested nutrient distribution is carbs 30%, protein 40%, and fat 30% of daily calories. Pay attention to calorie intake because of the challenge of burning off excess calories and fat. Add high intensity aerobic exercises to mobilize the fat and add weight training to tone muscles as the pounds come off. Proponents of this category, including medical internist Dr. Marie Savard a former ABC News medical reporter and author of the book, The Body Shape Solution for Weight Loss and Wellness, propose eating based on an android (male) or gynoid (female) body type. According to the 2013 edition of the textbook, Biochemistry, an android or a gynoid body type is defined by body fat distribution, influenced by male and female hormones. Women tend to have a gynoid fat distribution, although many women have a blend of both gynoid and android body types. Those with hormone disorders, such as polycystic ovarian syndrome, and some women after menopause, may have a predominantly android fat distribution. By choosing the right foods, you manage your weight and reduce the known health risks of the predominant fat distribution of each of these two body types. Men and women with an android body type (or apple) tend to be muscular, have slender legs, and accumulate fat around the waist, upper body, and breasts. Abdominal fat also tends to accumulate around organs in the belly (visceral fat), which is known to increase the risk for heart disease, diabetes, and other dysfunctions, according to Harvard Medical School. To reduce these risks, Dr. Savard recommends a high carb diet with moderate fat and protein. However, because of the carbohydrate intolerance, the science would suggest a low-carb diet such as a diabetic diet, recommended for people at risk for type 2 diabetes by the Joslin Diabetes Center. Eat complex, high fiber carbs, such as whole grains, fruits and non-starchy vegetables, which will improve carbohydrate tolerance. Limit starchy carbs such potato and yams, refined white rice and pasta, and convenience food, and avoid simple sugars, desserts, candy, and soda. Eat lean protein such as lean meats, skinless poultry, and fish, including salmon and mackerel for omega-3 fatty acid heart protection. Eat healthy fats, such as reduced fat dairy and nut butters, and flaxseed and olive oils. Add an omega-3 supplement if you don't eat enough fatty fish. A suggested division of daily calories is 40% carbs, 30% protein, and 3O% fat. The good news for android types is that when you eat fewer calories than your body needs, you tend to lose abdominal and visceral fat first. A gynoid body type (or pear) has a small upper body, breasts and waist. There is a tendency to accumulate fat on the lower half of the body, such as the buttocks, hips, and legs, which may be more difficult to mobilize than belly fat. Dr. Savard advises people with a gynoid/apple body to eat a low-fat diet and to ensure enough calcium sources to decrease the risk for osteoporosis. Choose sources of healthy fats, such as reduced fat dairy and nut butters, flaxseed and olive oils, and salmon and mackerel for omega-3 fats. Limit nuts and limit or avoid convenience foods and salt. 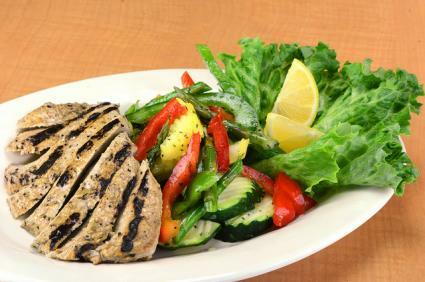 Add lean protein such as skinless chicken and complex carbs of whole grains, fruits, and vegetables. Include calcium-rich vegetables, such as spinach, broccoli, kale, collard greens, bok choy, and seaweed, and consider taking 1500 mg of calcium supplement a day. Dr. Savard recommends dividing your daily calories between 10% fat, 45% carbs, and 45% protein. Some advocates, such as Dr. Elliot D. Abravanel, believe that a person's body type reflects which hormone gland controls his or her body. In his book, Dr. Abravanel's Body Type Diet and Lifetime Nutrition Plan, Abravanel describes four gland body types: pituitary, thyroid, and adrenal or gonadal (testes or ovaries). Women fall under one of the four types, while men are grouped into three, pituitary, thyroid, and adrenal because Abravanel says men are already defined by their testes. The theory is that you can overcome the challenges of food cravings, metabolism, fat and weight, by avoiding foods that stimulate your dominant gland. To determine your body type under Dr. Abravanel's method, you will want to visit his webpage. Have more energy in the morning and lower in the evening. Diet recommendations you will get after entering your information on the website are geared to improving your overall body shape, strength, and energy, and include eating a diet high in lean proteins and low in processed foods and sweets. The recommendation is a low-carb, high protein diet, as well as no caffeine to improve energy level and endurance while reducing food cravings. Adrenal body types are advised to eat a diet high in complex carbs and lower in protein to decrease fat on the upper body and stomach and improve energy. Diet recommendations are said to help to shed weight on the buttocks and decrease cravings for rich, creamy foods. Recommendations include a low-fat diet with no red meat, minimal fats and oils, and minimal spices. Dr. Carolyn Mein, nutritionist and author of Different Bodies, Different Diets, goes further than others and makes eating for your body type even more complicated and difficult to follow or prove. Dr. Mein describes 25 body types in her 25 Body Types Systems program, each based a hormone gland or organ system that is said to predominate. This includes such body types as hypothalamus, pineal gland, eye, brain, skin, and liver. The description of each body type includes a personality profile and from this total analysis, Dr. Mein recommends what to eat. For example, in the case of the liver body type, she advices "supportive foods" such as meat, potato and gravy. To access more detailed information for each body type you buy the booklets or downloadable ebooks on her website. Add exercise to this to help you manage your weight and fat accumulation, and maintain lean muscle mass and optimum health. If your inherited body type is short and stocky, you cannot convert it to tall and lanky through your diet, so set realistic goals for your body. Speak with your doctor if you plan to make major changes in your diet and exercise based on theories of eating for your body type.